I love to travel because when I’m in another country, it’s as if time stops and all life at home is put on hold. I’m more relaxed, I get to see and taste new things and I’m more open to new experiences. I become more willing to think “why not?” instead of my usual “that’s not me.” I feel changed. You know the scene in You’ve Got Mail when Birdie hints that she was once in love with General Franco and Meg Ryan defends her to Greg Kinnear, saying, “It happened in Spain. People do really stupid things in foreign countries, “ and he says, “Absolutely. They buy leather jackets for much more than they’re worth. But they don’t fall in love with fascist dictators!” I think of that every time I look in my closet at the really stupid things I did in foreign countries, otherwise known as The Graveyard of Clothes I Bought on Vacation. When I’m on vacation, I tend to forget that you need to have confidence to take fashion risks and I am not a confident person. 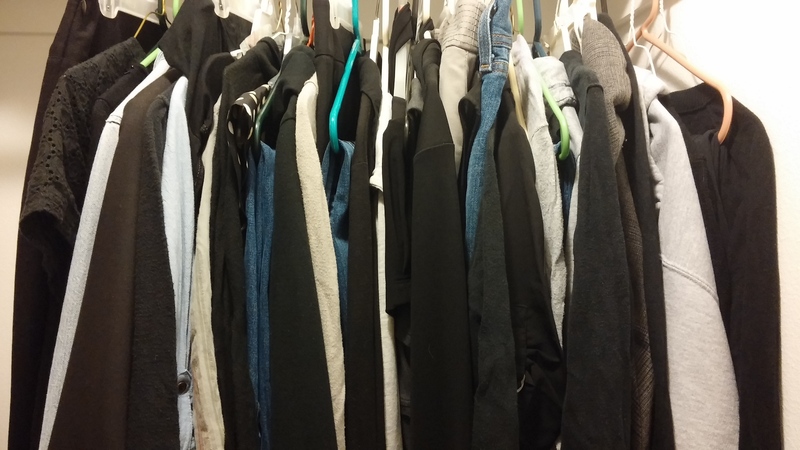 My wardrobe’s primary colors are very safe: black, grey and denim. The most colorful things in regular rotation are the plastic hangers. My lack of confidence is also why I’m not a boot person. It’s not that I don’t like boots, it’s just that in my mind, I’m not the type of person who could pull off wearing boots. I was pretty sure that if I ever did wear boots, everyone would look at me and say, “What are you doing wearing boots? You’re not a boot person. Who are you trying to kid?” But every once in a while when I’m shopping, I stop to look, just in case I find a pair that looks like the kind of boots I would wear if I were a boot person. Well guess what? 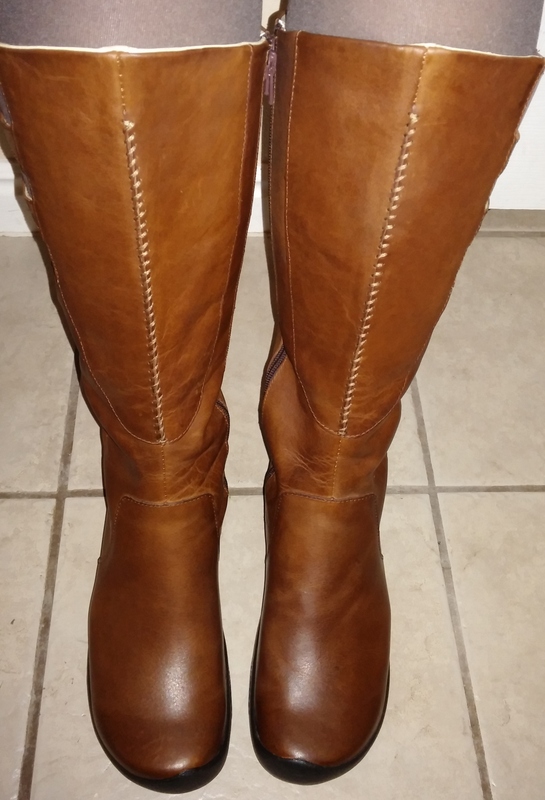 I found some boots ON SALE that I thought I could actually wear. The problem is that I was on vacation when I bought them, which makes Everyday Me question the decision. Even my bank knew it was an uncharacteristic purchase – it froze my card until I called in to verify that yes, as crazy as it sounds, I did buy boots. Hard to believe, Bank, but true. I’m still unsure about wearing them, but they were a substantial purchase and I don’t want them to waste away in the closet. So this week, I had to make wearing my new boots an actual assignment. And while I was at it, I decided I might as well go whole hog and dust off the Clothes Graveyard as well. Pretty exciting, isn’t it? Finally getting around to wearing all those things I bought while I was in an altered state of mind? Is it safe? Should I do this? And because I know myself, I added a rule that I couldn’t explain to anyone why I was dressed that way, or make any self-deprecating remarks, or do anything else to acknowledge that anything unusual was going on. (Only my husband was in the know.) I had to work it and own it and pretend that I didn’t feel self-conscious about it. It was going to be so difficult. Even when I’m wearing something I really like, I feel self-conscious; I can’t even accept a compliment graciously. 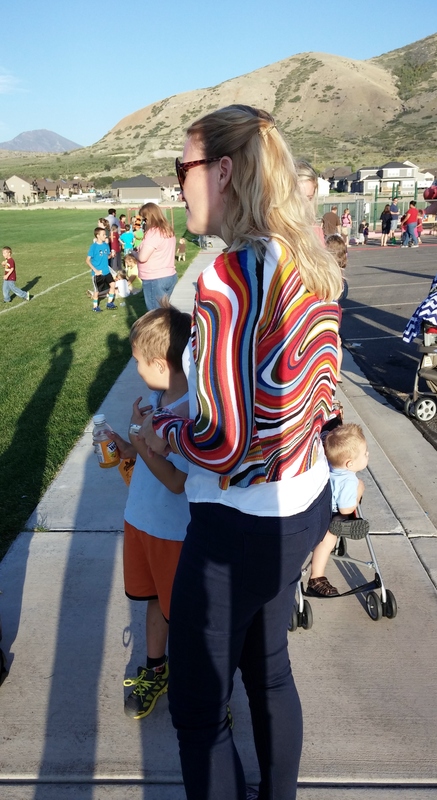 On Friday I wore my Psychedelic Cardigan to help at the school carnival. 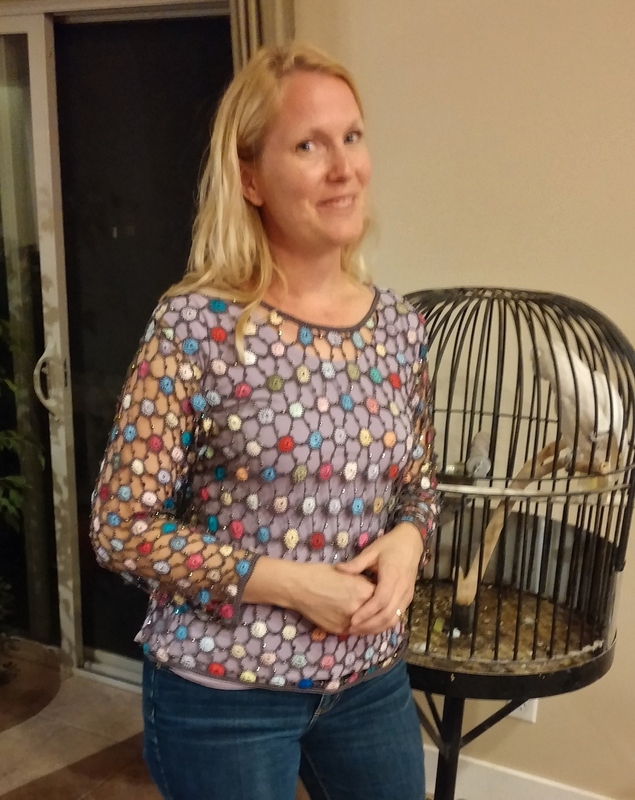 I bought the sweater in Bali when, after passing it in window displays three times, I sheepishly admitted to my husband that I really liked it. Since he’s always happy when I stray from gray, he immediately dragged me into the store. The smallest size they had was medium, so I was ready to leave, but my husband asked the store clerk if they had any smalls. The man looked me up and down and said, “That’s an Asian medium, so you’ll be fine.” Judgy and rude, but he still got the sale. On Saturday we went to a dinner party with family and close friends, so I figured that would be a safe space to wear what I consider to be my strangest purchase: The Macrame Sweater (or shirt? not sure what it is but it reminds me of those mesh pear cozies you find in fancy fruit baskets). 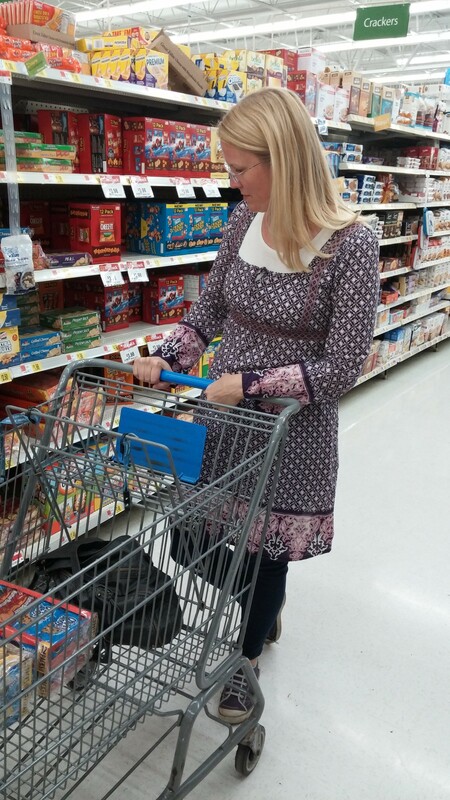 I bought it in Sweden after my husband insisted it wasn’t too weird, but once I hit the mainland, I never wore it because it is too weird. 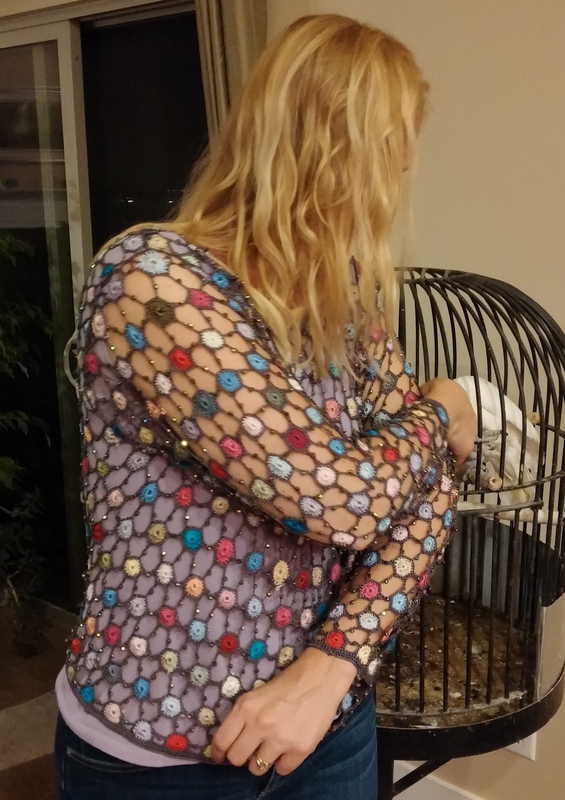 I did wear it once for a performance because it’s sparkly but I got lots of curious looks, so back to the closet it went. 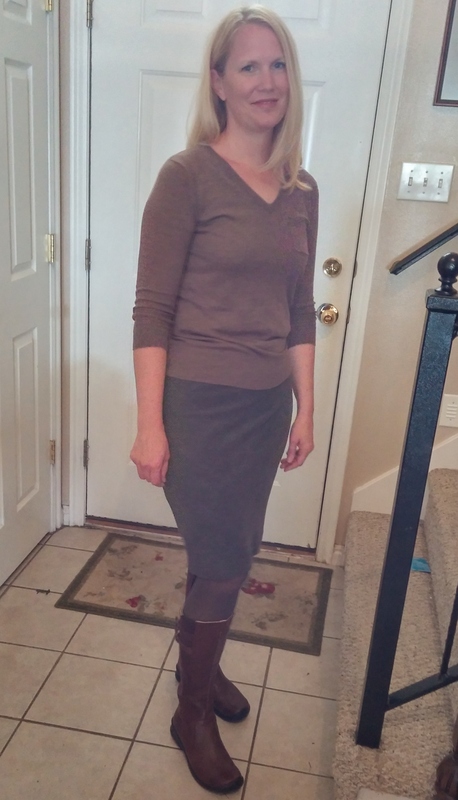 On Sunday, I wore my boots for the first time. I felt self-conscious walking out of the house in them and they’re not like a new shirt that you can forget you’re wearing – boots are bulky so they make their presence known at all times. But as we sat in church and my son was complaining about being cold, I was quite pleased with the warmth they provided me. Plus, they make me feel kind of powerful. Imagine if I had to kick someone with these boots on. Think of the damage I could do. My next item is something I wear quite often as a costume, but when I originally bought it I actually thought to myself, “I know it doesn’t look like anything I’d ever wear ever, but…” That’s right, I actually thought Everyday Me would wear a FAUX FUR ZEBRA PRINT bolero jacket. I am not even kidding. It is incredibly soft to the touch, but if I wanted a tactile experience, I could’ve just bought a rabbit’s foot key chain. 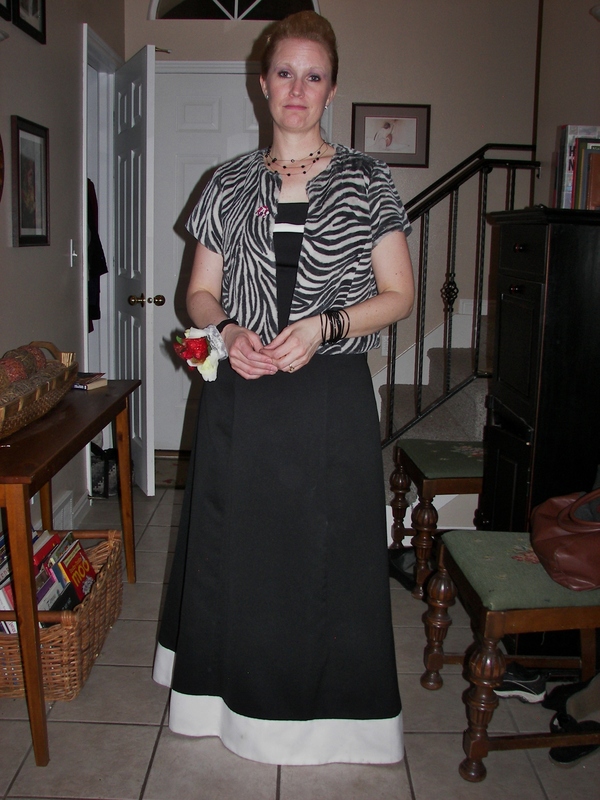 Here’s me wearing it for a fake prom a few months ago as a joke and then here’s me on Tuesday wearing it to take my son to school “for real.” Yes, nothing’s too good for my child. 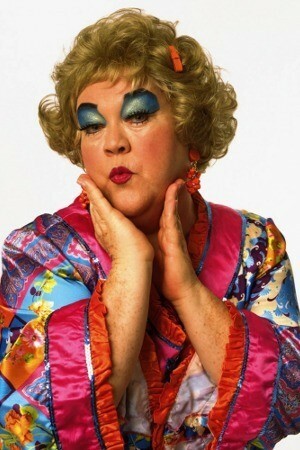 I dress up to show him I care. I’m not sure what I expected to learn from this experience. Maybe I wanted to see if I could become less mousy in my appearance if I shook up my wardrobe a bit. Perhaps I just wanted to get my money’s worth on these purchases before tossing them. I’m not sure, but one thing I do know is that the boots and Psychedelic Cardigan will stay in my closet but the rest will go to the costume bucket or to a good home if anyone wants them. This experiment was a good opportunity for me to learn to stop responding to compliments with grunts, eye rolls, or self-deprecating remarks. I think I will continue that exercise in the future with my less weird clothes since this is a habit that has annoyed people my whole life. I can remember a friend’s dad shouting at 12-year-old me, “Just say thank you! That’s all you have to do when I compliment you!” And I’m sure my husband is screaming the same thing in his mind pretty much every day. This week also made me wonder – is my husband really sweet and attentive or does he just have terrible taste? Because he was full of compliments all week. Maybe it was because he knew how difficult it was for me to not make fun of myself, or, more likely, he was just being extra nice because he felt guilty that he was the one who talked me into buying most of this stuff. When my firstborn was a few months old, we went to dinner at a new acquaintance’s house. It was a family with older children, ranging from elementary students to teenagers. As a new mother, I noticed many things about the home and emotional environment that I wanted to emulate – happy kids, loving parents, celebration of creativity, etc. One particular exchange stood out to me between the mother and her son. He was showing her some Pokemon cards and explaining about all the different characters and she was listening with great interest, asking questions, responding in a way that showed him she was paying attention. I remember thinking, “How can she care about Pokemon?” and then realizing that she probably didn’t care at all about Pokemon, but she cared about her son and wanted him to feel valued. 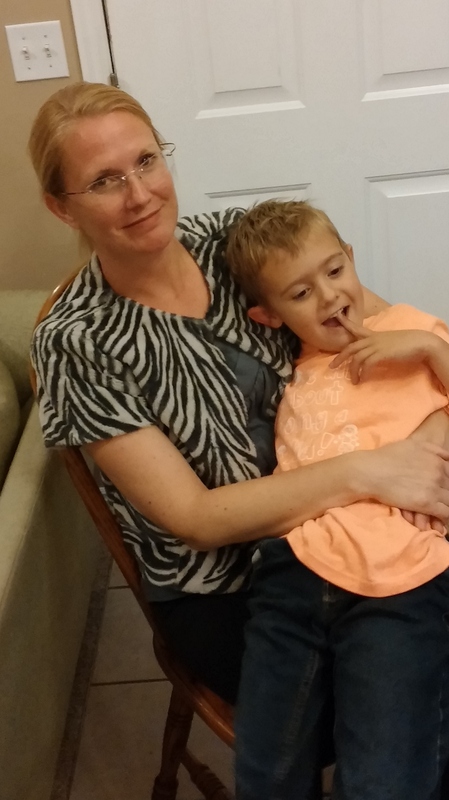 I was so affected by it that I resolved to be that kind of mom when my son was older. 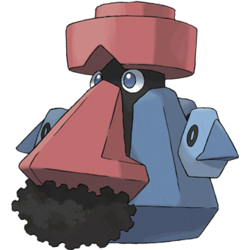 I’ve realized that I am happy to listen to my boys talk about subjects that interest me, but when they enter the zone of Things I Consider a Waste of Time: 1.Video Games, 2.YouTube videos, and 3.Pokemon, a.k.a. The Only Subjects My Boys Talk About, I tend to just shut them down. Sometimes, on a good day, I manage to respond with a distant, “Oh, really? Huh. That’s cool,” without actually listening to what they’re saying. But on my less patient days, I cut them off or ask them to change the subject, sending the message to my children that I just don’t care about what they have to say. And I’m ashamed that I’ve let it become such a pattern that they don’t even act surprised when I do it. I feel like I’ve failed at the one specific goal I remember making those first few months of being a parent. This summer, we went on a trip just as one of the boys had downloaded a new Pokemon game. We were amazed that all of them were interested in this game (even the 16-year-old). They had to work out a system so everyone would get a turn and when they weren’t playing it, they were constantly talking about it or looking over the current player’s shoulder. 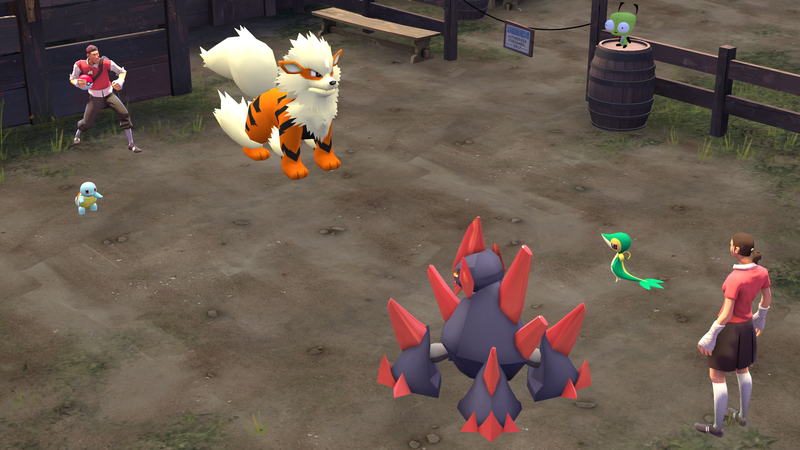 It was excruciating for us to sit in the front seat of the car and listen to the discussions, (“Psychic blah blah evolves blah blah super effective against yaddah yaddah rock type against electric type blah blah legendary BLAH BLAH BLAH…”) but neither my husband nor I wanted to interrupt them because they weren’t fighting. They were all getting along – all four of them AT THE SAME TIME. This never happens. I realized that as much as I hate listening to kids talk about Pokemon, I can’t deny there’s something about it that they value. And that’s when I realized it was time for me to learn about Pokemon. All the information was too overwhelming, so I just asked specific questions, starting from the most basic. Fritz and my second son answered them very clearly – so clearly, in fact, that it was obvious to me that Fritz had already worked these questions out in his mind enough to give me very reasonable answers. I had always assumed that when he played with the older brothers, they were just humoring him, but he seemed to be able to hold his own in our Q and A session. Fritz approaches Pokemon as an educational experience. Like his brothers were at his age, he’s more interested in non-fiction books than stories. He loves learning about animals and remembering facts about their habitats and food preferences. As we watched Pokemon together, I realized he’s just transferring that same interest in actual creatures to fictional ones. He once asked me to pull up a new show on Netflix because he needed to learn about all the Pokemon. In other words, he doesn’t see the shows as entertainment but as a form of research. 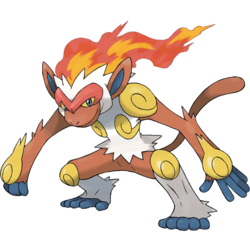 I was watching one of the shows with him and was thinking how annoying it is that the only sounds the Pokemon make are their own name. I mean come on, a cow says “moo” not “Cowcow COW cow.” But Pikachu says “Pika…Pikachu.” It was really driving me crazy. 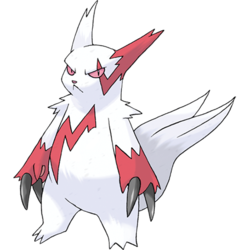 As if he was reading my mind at that moment, Fritz turned and explained to me, “The Pokemon only say their own names. That’s how you know what they are called.” And then it made perfect sense. How else are these kids supposed to recognize and learn the names of all 718 characters? I know I’ll never be able to keep track of all the Pokemon, but I did make an effort. 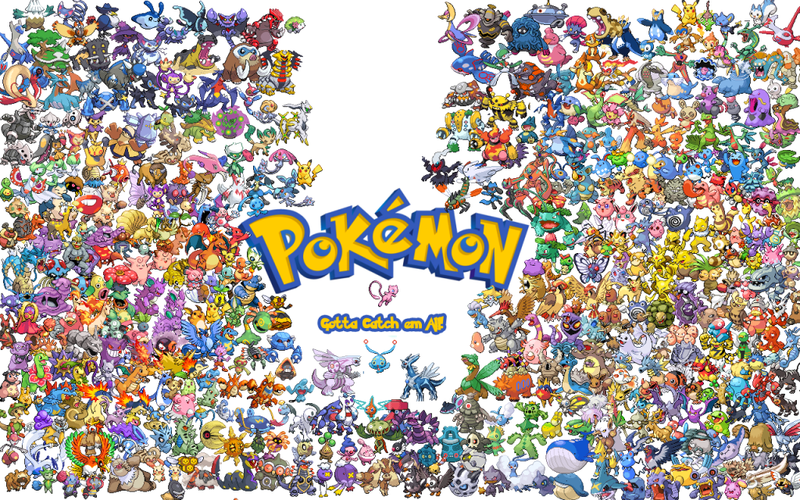 I studied them all on pokemon.com and tried to absorb the information but it all became a bit of a blur in my mind. If you’re new to this whole world, I don’t want to overload you with too many facts, but here’s a sampling of what I consider to be the most notable creatures. 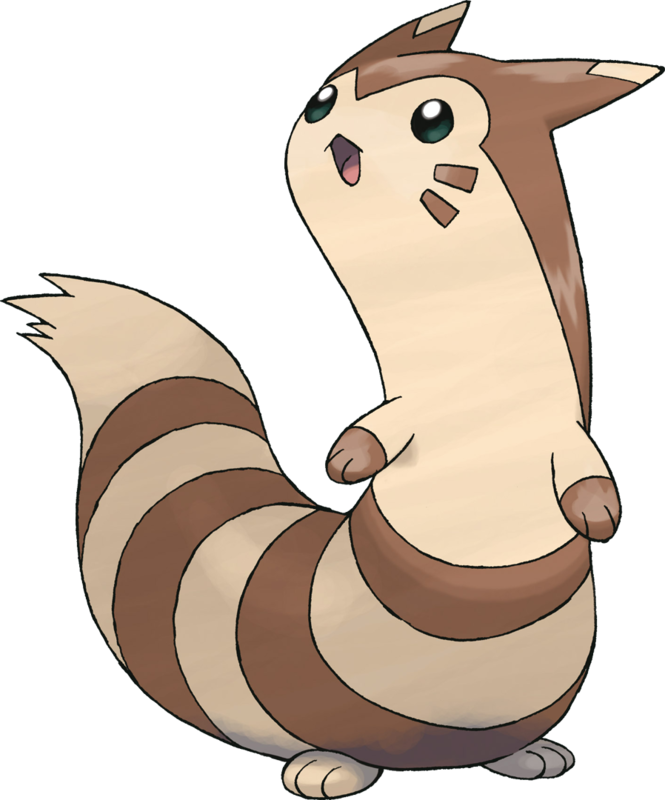 In my opinion, the cutest Pokemon are (L to R) Ditto, Espurr, Furret and Piloswine. 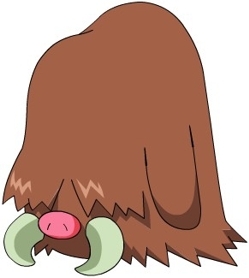 Seriously, Piloswine is so super cute. 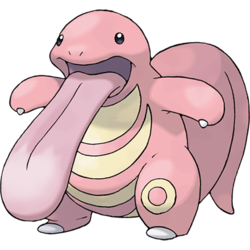 The Pokemon that make me think, “Huh?” are: Lickitung (Wouldn’t it trip over that tongue? 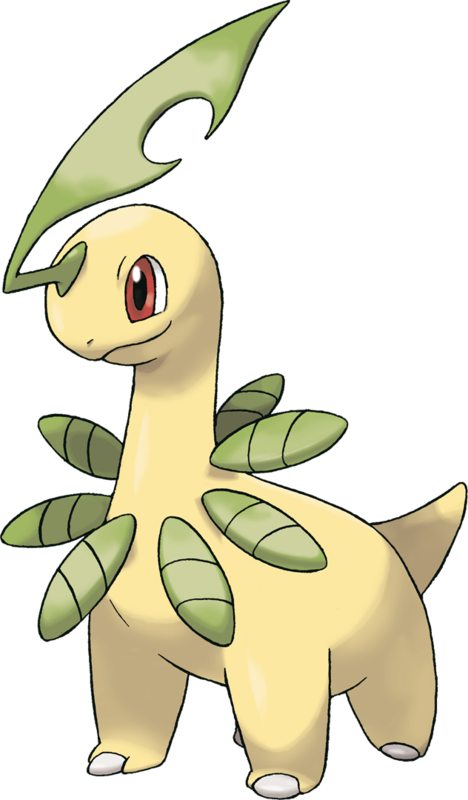 ), Sudowoodo (What? I don’t get it. ), Mr. 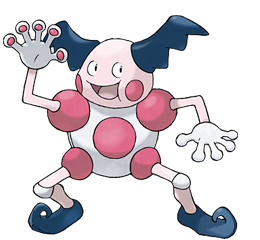 Mime (Why does it bother me so much that his fingers are all the same size? 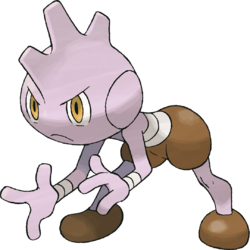 ), and Probopass (I just…huh?). 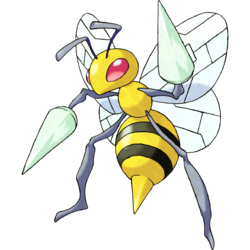 The most frightening Pokemon are: Mantine (because Sting Rays), Infernape (because Monkeys), Beedrill (because Bees), and Tyrogue (because icky fingers). And no, I’m not weird for thinking those things are scary. If I had to choose the top four (only four?) 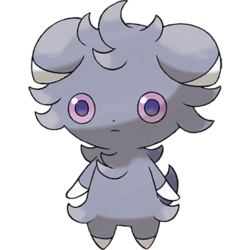 Pokemon that make me say, “Well, that’s a stretch,” it would be: Bayleef (What’s that on its head? 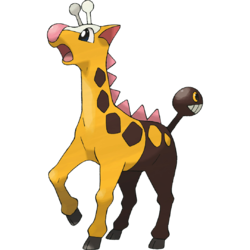 ), Girafarig (What’s that on its tail? 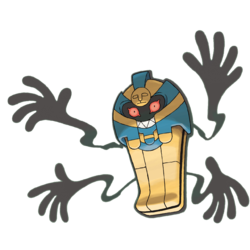 ), Cofagrigus (Did they get it from a Scooby Doo episode? 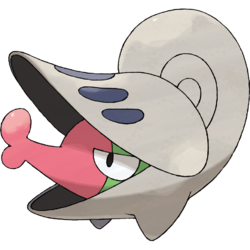 ), and Shelmet (Gee, I wonder how they came up with that name?). 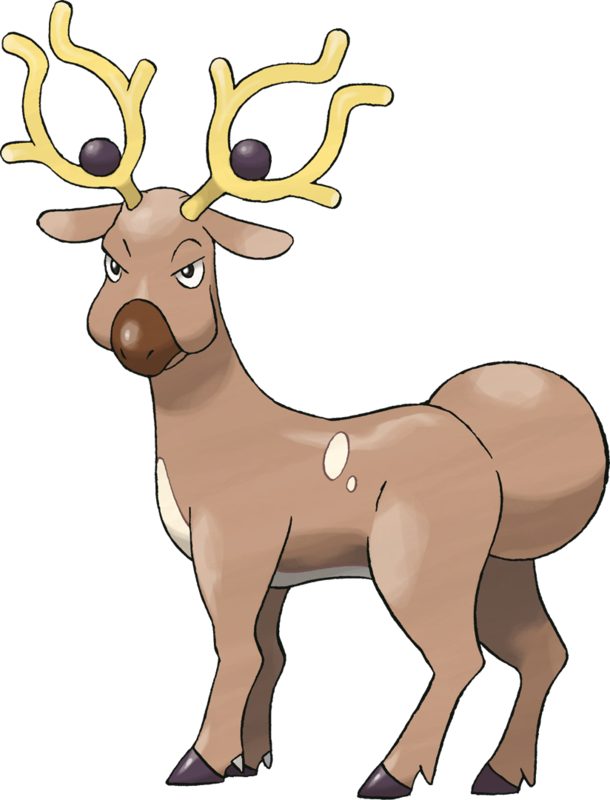 And these guys just creeped me out: Lopunny (Ew), Stantler (Is that a growth? 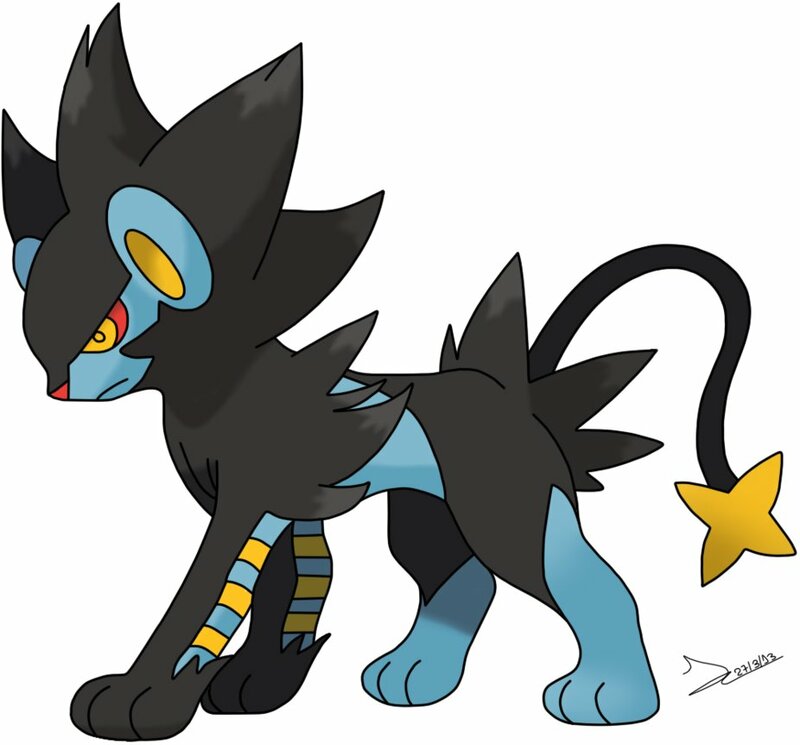 Should we get him to a vet at the Pokemon Rescue Center? 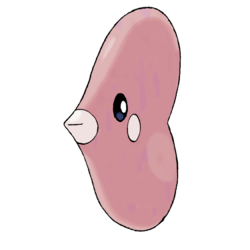 ), Luvdisc (Luvdisc? Am I the only one who thinks that’s weird? 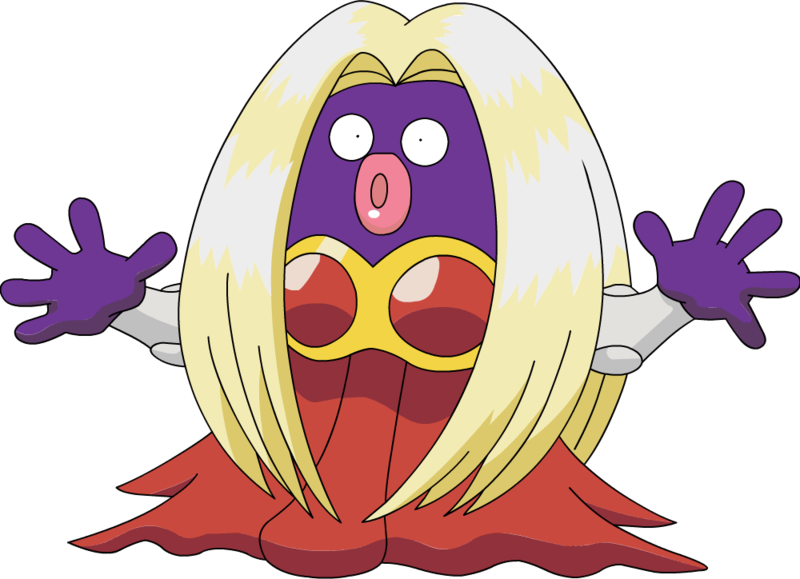 ), and Jynx (Yikes! 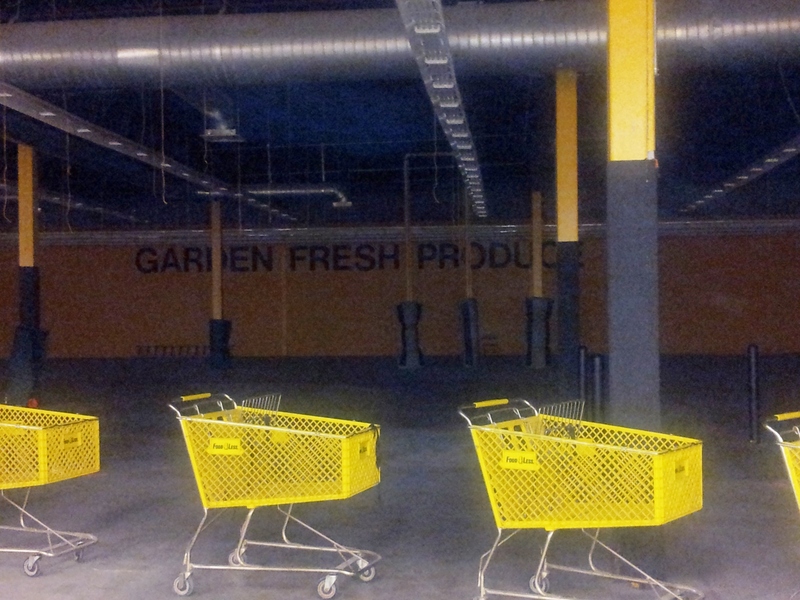 Nightmares!). 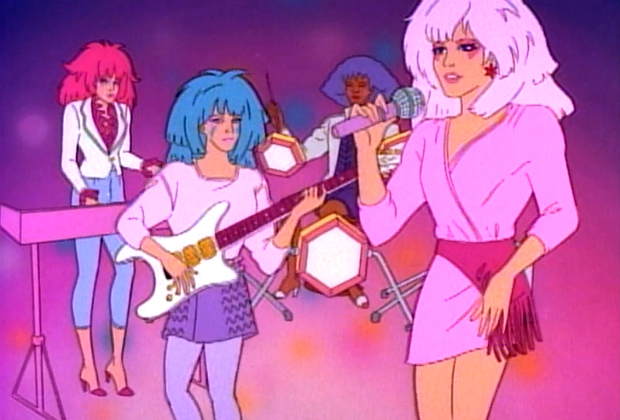 But I think the most awesome Pokemon are those that look like they’re on their way to audition for Jem and the Holograms: Blaziken, Entei, Zangoose, and Luxray, (“We are the Misfits, our songs are better…”). 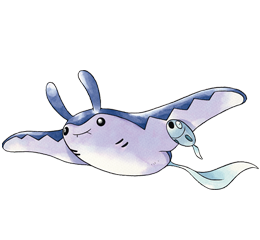 During my weeks of intense training, I watched many Pokemon episodes (so, so many), explored the official Pokemon website, tried playing one of the video games, attempted the card game, and I’m still totally, helplessly confused. I took this quiz and got 1/20 correct. I think my boys appreciate that I made an effort – they seemed to enjoy playing the teacher, even when (or especially when) I was clueless. I now understand more than I used to and I have a better appreciation for what my kids see in it, but I think theirs is supposed to be a world without grownups. I don’t think it’s supposed to appeal to me and I don’t think I’m supposed to get it. I’m afraid I’ll still be answering them with, “Oh, really? Huh. 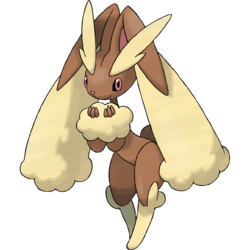 That’s cool,” whenever they talk to me about Pokemon from now on–not because I don’t think there’s anything to it, but because there is simply too much to it and they’ve got too much of a head start for me to ever catch up. Hopefully they’ll know that it’s not because I just don’t care. It’s because I don’t understand what the heck they’re talking about. 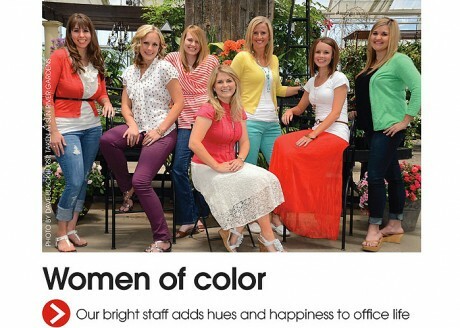 And I’ll admit, it was an adjustment, and often there are moments when I wonder if residents are aware of life outside Utah County, like this photo and caption found in Utah Valley magazine (“Women of Color” – because some of them even have brown hair). 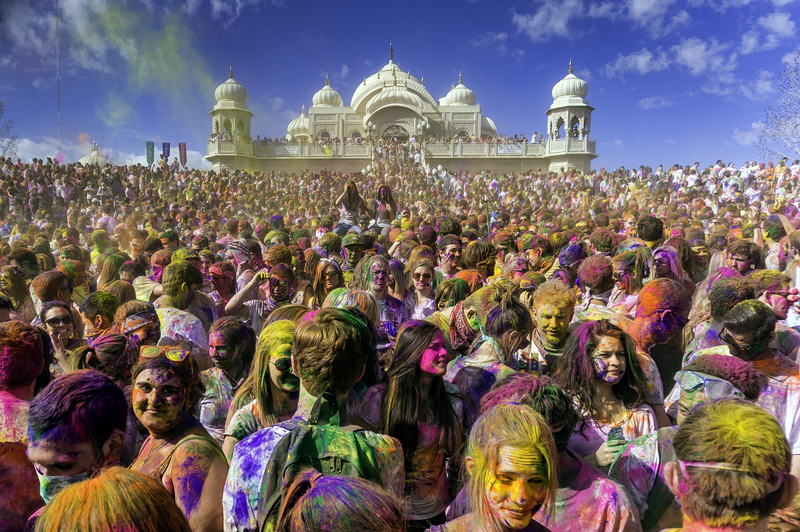 On the other hand, just down the road, the Holi Festival at the Krishna Temple draws thousands of Happy Vallians, blocking up the freeway and my Facebook feed with their colorful, Happy faces. Case in point: Saturday night, my husband and I attended what I consider to be the polar opposite of your typical Happy Valley event. 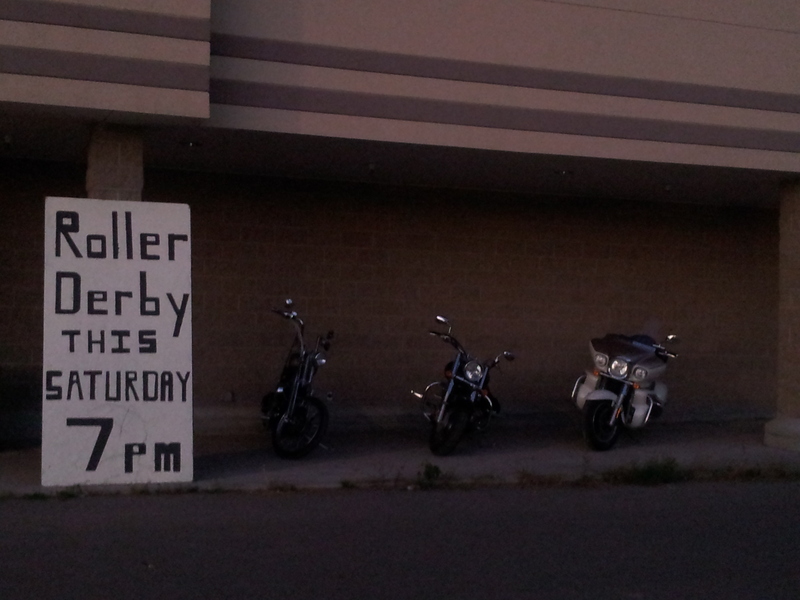 I don’t know if you’re aware of this, but Utah Valley has a roller derby league – the Happy Valley Derby Darlins, and although I had seen them in parades, it never occurred to me to actually attend a match. I don’t go to any sporting events and I’m especially uncomfortable watching violent sports. I didn’t think I could watch women knocking each other around live and in person. But when my husband saw the match advertised and asked if I wanted to go, I jumped at the chance. After all, I’m supposed to be trying new things, right? We had low expectations when we read about the venue and seating on the website, but when we got there, we realized the event was actually quite well-organized. In the parking lot, there was a section partitioned off with food trucks, live musicians, tables and canopies for eating, and even sidewalk chalk for kids to keep busy. 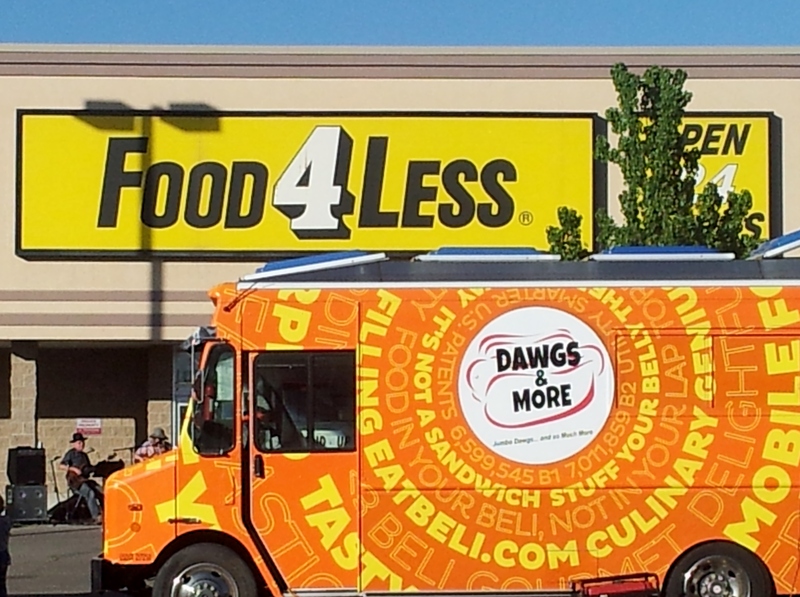 Did I mention the food trucks? Oh, my. 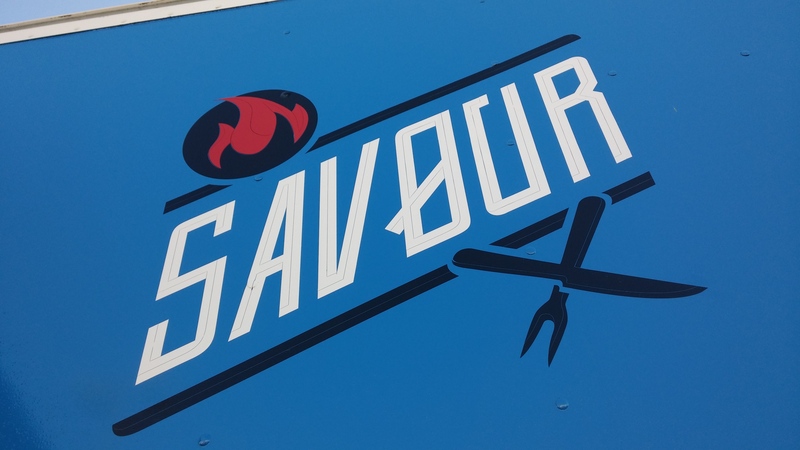 If you ever run into the Savour truck, get the Slider Sampler. 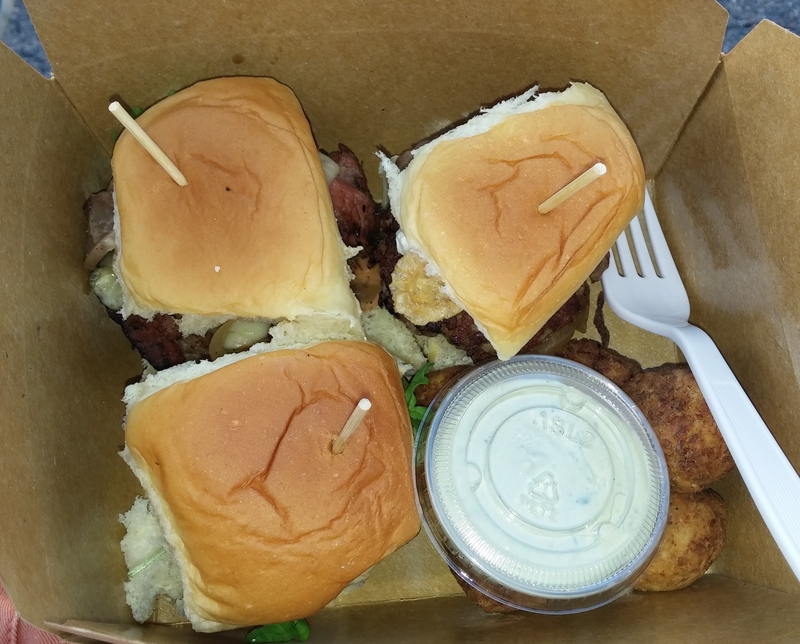 And the cauliflower tots. And the fresh peach turnover. And the girl who sang the national anthem was really good. Surprisingly good, given the venue. 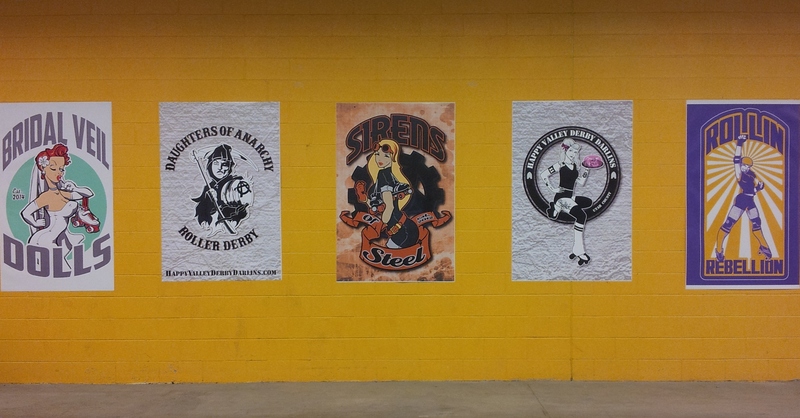 The league is made up of three regular teams (Sirens of Steel, Rollin’ Rebellion, Daughters of Anarchy), an intermediate team (the Bridal Veil Dolls), and an all-star team (the Molly Morbids). Each team member has her own derby name and they’re quite clever: Bloody2shoes, O Megative, Steel MagnoLeah, Demoraliza, to name a few. My husband felt very strongly that I come up with my own derby name, so I decided on K’Tastrophy (because it encapsulates what would happen if I ever attempted to compete in roller derby). There’s also a derby name generator, if you need help thinking of one, but it’s more generic. I think I’ll stick with mine. The whole atmosphere is pretty campy – the posters, the names, the fishnet stockings. But when the match started, all silliness went out the window and these women became serious athletes. The events aren’t scripted like professional wrestling, and even though the MC kept referring to it as a “show”, there was nothing fake about it. And sure, the uniforms go against Utah County’s unwritten dress code. (Who am I kidding? There’s nothing unwritten about it.) The shorts are short, but really, aside from the torn fishnets, how are their uniforms different from the BYU women’s volleyball team? I was kind of confused about the rules and scoring, but I don’t think I would be less confused at a football game, frankly. 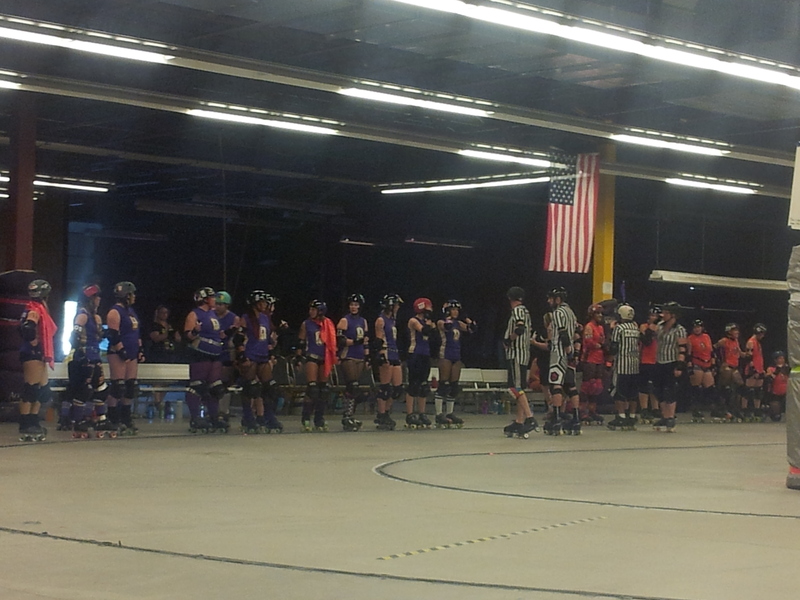 A few skaters (jammers) are designated to try to get past the crowd of other skaters. The defense lines up to block them, sometimes holding hands like a game of Red Rover, sometimes crowding together like a mosh pit. Hitting and kicking are not allowed, but apparently knocking other players with shoulders or hips is standard. The whole scene reminds me of walking down the hallway between classes at my son’s junior high school. 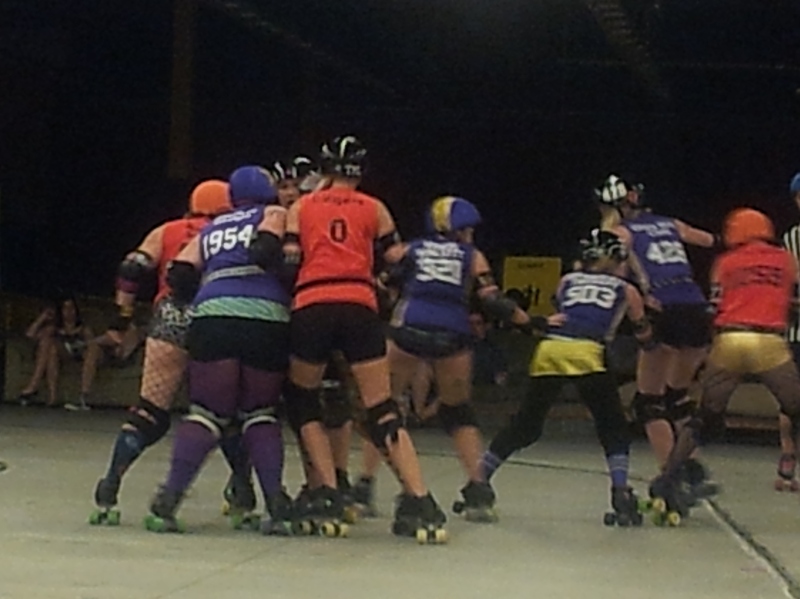 The match was between the undefeated Rollin’ Rebellion (in purple) and the Sirens of Steel (orange). I was impressed at the way a player could be skating along, looking straight ahead as if her attention was elsewhere, only to suddenly knock over someone coming from behind. 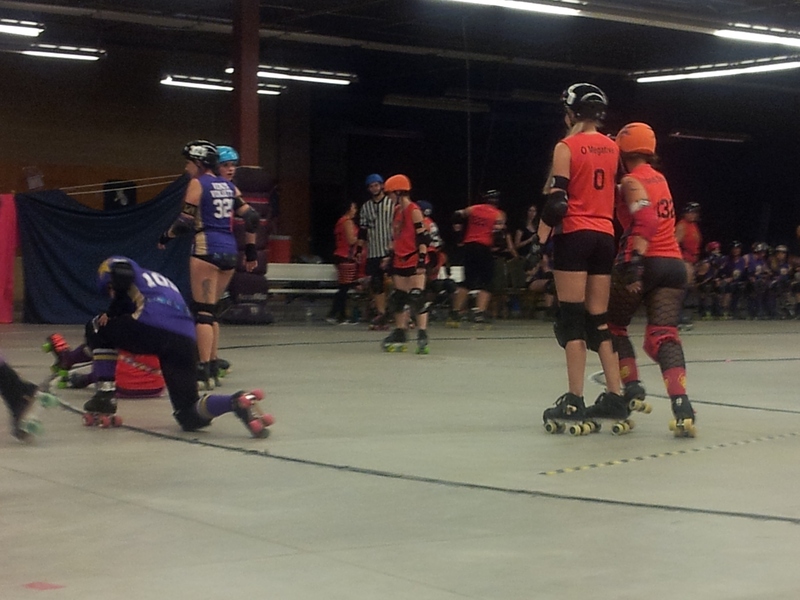 I couldn’t figure out how she knew exactly when the other skater would try to pass her – was it a timing thing, or did she have eyes in the back of her helmet? It was also interesting to see that sometimes a player would shove her own teammate – it looked wrong until I realized she was knocking her teammate toward an opponent so that teammate could knock the opponent out of the way. It was like a human Newton’s cradle. 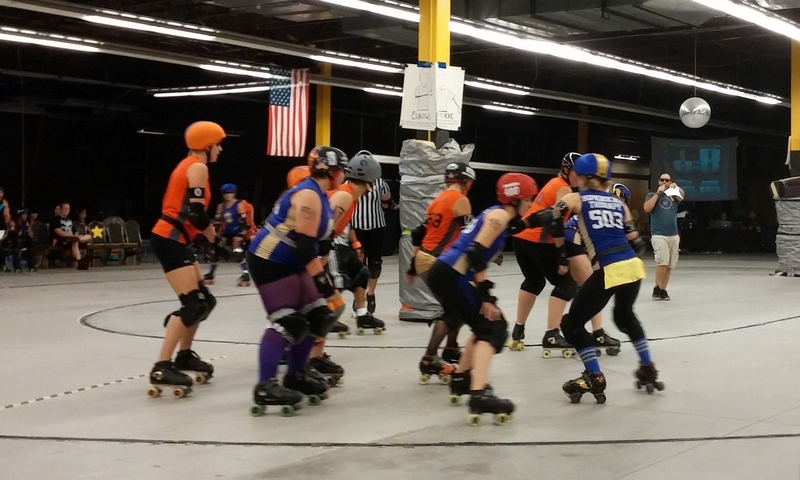 The score was pretty close throughout the bout, each team taking turns in the lead, but it was all decided in the last ten minutes when the Sirens’ Milli Megahurtz suddenly started scoring all over the place. (Wouldn’t I make a good sports reporter?) She was the high scorer of the match, and most of that happened right at the end. 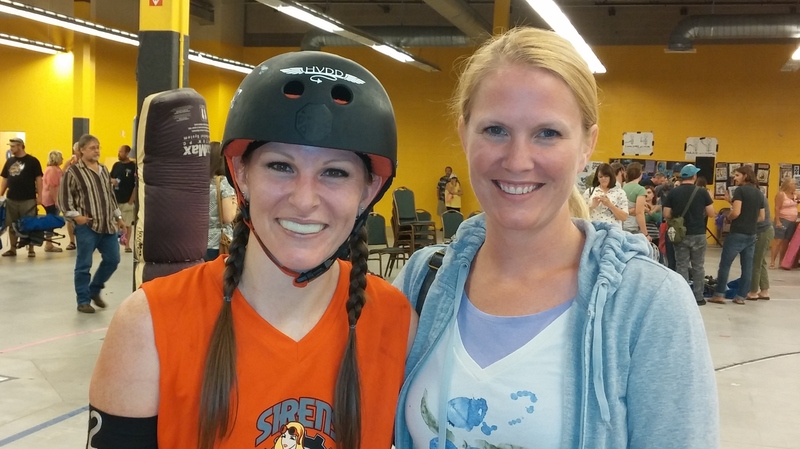 She helped her team beat the undefeated Rollin’ Rebellion, and then I got to meet her. And she was super sweet and smiley — and completely Utah Valley! We had so much fun – both the food and entertainment made for a great night out. And maybe we’ll make it back for the home team tournament on September 20. And maybe some of our Happy Valley friends (each of you freaks in your own special way) should join us. Eighteen years ago, my husband and I decided we should try to exercise so we went to a nearby park and ran, confident that this was just the first of many healthy decisions. We were going to have a plan and a schedule and we were going to be awesome because it was the 90’s and everything in the 90’s was awesome. The next day, I had serious knee problems which lasted for weeks. Obviously, this meant that I’m just one of those people who can’t run. Some people are built to run, others aren’t. Nothing to feel sad about, just a fact of life. Three years ago, my husband started running regularly, which I thought was great for him. I was very supportive – I never joined him, but I was happy to make time for him to do it. At some point, I realized that my earlier negative experience with running probably had a lot to do with the fact that for my whole life up until that one time I ran, I had been a total couch potato, that I hadn’t eased into it, and that I hadn’t stretched before or after that first run. No wonder I had been in pain. I decided to try again, this time approaching the exercise with a little more wisdom than I had previously. So I ran a few times with my husband in the evening. He was nice enough to run more slowly than he’d like for fewer miles than he’d like just so I’d have a running partner. It went okay for a while, but then one day we went running in the morning instead of the evening and I got really sick to my stomach and had to walk the last two miles. And since running in the morning made me sick, obviously this meant that I’m just one of those people who can’t run in an actual, organized 5K race. 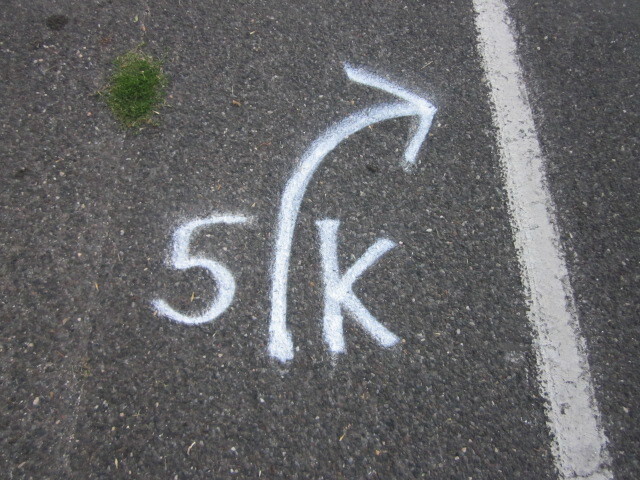 This simply reinforced my earlier decision to avoid 5Ks because everbody does 5Ks. 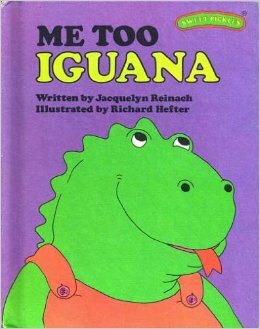 I’m always afraid of becoming the Me Too Iguana, doing all the things that everyone does because everyone does them. My husband stuck with the running and progressed quickly from his first 5K race to a 10K, then a half marathon straight to a full marathon, all within a year and a half. I stuck with my Jillian Michaels dvds in the privacy of my own home. The thing about doing this blog is that it’s forced me to revisit and reexamine many of my preconceived ideas. It can be embarrassing to look at some opinion I’ve held tenaciously as fact only to realize I was so very wrong. And since I’m very vocal about my opinions, that makes retracting them even more conspicuous. That’s why this whole experience has been simultaneously eye-opening and uncomfortable. So a few months ago I registered for a 5K. I planned out a training schedule, mapped it out on the calendar, then totally ignored the plan because I hate to run. I think I ran maybe five times this summer, and the last run was a full week before the race. I don’t mind exercising, but forty minutes of running feels like three hours to me because running is stupid and boring. I was not feeling prepared and I was starting to relive all of the guilt I used to feel before a big piano competition I hadn’t adequately practiced for. My husband had been feeling sick and was starting to wonder if he was up for it (he was running the 10K) so I had plenty of chances to just back out of the whole thing, but we both decided to go through with it. 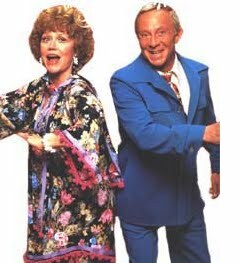 I was really grouchy the night before and kept saying, “Running is SO STUPID!” Fritz asked if I was going to win. When I said that I probably wouldn’t, but I would finish, he said, “Why would you run a race if you’re not going to win?” Why, indeed? On the way to the race, I was second-guessing my decision to humiliate myself in my own town instead of somewhere far away among strangers. And I had more piano competition flashbacks as I kept trying to keep my fingers warm without realizing that’s what I was doing. After my husband and I separated to our respective races, I felt all alone standing at the starting line. But soon I noticed some friends and neighbors and piano students in the crowd and I started to feel more relaxed. 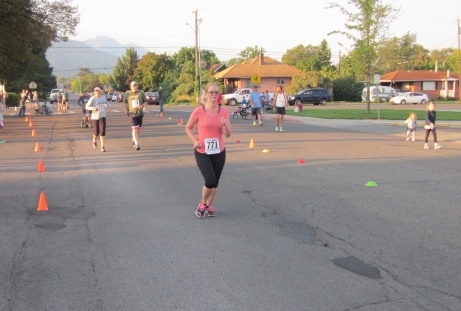 Maybe a small town race wasn’t such a bad idea for a first timer like me. And then we were off! I found a few people around me whose pace seemed compatible with mine and I let them be my personal pacers. It felt a little bit stalker-y, but keeping my eye on that one lady with the green shirt really kept me going. She’ll never know what staring at her back for thirty-six minutes straight meant to me. And I ran the whole time! And I didn’t puke! (I almost did, though – right after I crossed the finish line, the poor water boy almost got it right in the face.) And it was pretty fun, considering how stupid running is and how much I hate it. And my time wasn’t nearly as bad as I thought it would be. And my parents brought my kids over so I had someone waiting for me at the finish line. And after it was all over, I was like, “Hey! Yay!” and then I had this song running through my head instead.